You Don’t Have to Justify! A few weeks ago I was teaching a class about the “business end” of a machine quilting business. In this class, along with a lot of other things, I talked about offering additional services, such as binding quilts, to your customers. In my opinion, binding quilts is not that hard to do and you can make a fair amount of $$ at binding quilts. Binding #1, $2.50 perimeter foot – Trim the quilt, make the binding (straight binding, cut selvedge to selvedge) and apply the binding to the front of the quilt using my home sewing machine. The customer is responsible for hand stitching the binding to the back of the quilt. Binding #3, $3.50 perimeter foot – Same as Binding #1 except that I hand stitch the binding to the back of the quilt. Binding #4, individually priced – This is Custom Binding such as bias binding, piped binding or any other type of binding that is different from Bindings #1 – 3. There is no “upper limit” to the price on this type of binding. Example – a Queen Size quilt is 90 x 108 inches (the size of a pre-cut Queen Size batting) which equals 33 perimeter feet. (90 +108 x 2 divided by 12 inches per foot = 33 perimeter feet) Of course, the number of perimeter feet would be different on different sizes of quilts. Binding #3 – $115.50 – it takes me at least 2-1/2 hours, probably more, to make and apply this binding. Binding #4 – is not included in this example. I stated that of the customers who have me apply binding, they usually chose Binding #2. And, I love the $$ I can make applying Binding #2! Everyone in the class seem receptive to the idea of charging for binding and for the prices I was suggesting. Note: If you are NOT offering binding services to your customers, please think about doing so! I would also like to say that in my business, only about 15 – 20% of my customers have me put the binding on their quilts. I don’t tell my customer how much time it will take to apply the binding to their quilt – I also don’t tell my customers how much time it has taken me to complete the quilting on their quilt. A few days ago I received an email from one of the students in that class. Among other things, she stated that, in her opinion, I was “gouging” my customers in my pricing for my binding, mainly because it takes me such a short time to apply a binding (Binding #2)! Fair warning – I am going to rant for a little bit! In my classes, I tell people how I run my machine quilting business. I am not saying that my way is the “best” way or the “right” way to do things – it is the way that is working for me, at this moment in time. YOU are an independent small business owner. If you feel that my prices are too high or too low, you can charge what YOU want in YOUR business! I am NOT going to come and re-possess your quilting machine, or do harm to your quilts if you don’t charge the same as what I charge! Price Gouging – The practice of raising prices on certain types of goods and services to an unfair level, especially during a state of emergency. In my mind, “gouging” the customer is also when you are the ONLY person in an area who can do “something” and you charge a huge amount of $$ to do so. I do feel that something should be said about experience. I have been applying binding on my own quilts and customers quilts for well over 20 years. I am efficient at applying binding and I almost have a “system” when I do so. Because I can apply the binding efficiently in a relative short period of time should I charge LESS for my binding services? I say No! The same could be said for my quilting. Because I can quilt some patterns efficiently and in a relatively short period of time, should I charge LESS for those quilting designs? Again, I say NO!! If my customer is willing to pay the $$ for me to bind their quilt, it is their choice. I do a good job and the job is done well. In my opinion, it is NOT gouging! I am now finished with my rant and I hope that you will feel free to post your comments about this. I wish everyone a happy and prosperous 2016 filled with LOTS of customer quilts for you to work on! January is typically a slow(er) month for machine quilters. This is the time to take a break and re-charge yourself, clean your quilting room (mine is a disaster), work on some of your own projects, and maybe make some samples of new techniques and patterns you have acquired last year. You can then offer these new patterns and techniques to your customers at a higher fee! The start of a new year is a great time to raise your prices! Even if it is only half a cent raise, at least it is a raise. If you are normally charging one and a half cents per square inch (,015), change it to two cents per inch (.02). You just gave yourself a raise – which you deserve! You also do NOT have to let your customers know that you are raising your prices. Just do it! The next time your customer comes to you, quote them the new, higher price and don’t say anything about it. I will bet that your customer won’t even notice the difference. Here are some numbers – A Queen Size quilt, 90 x 108 inches = 9720 square inch (psi). The old price of .015 cents psi would equal $145. The NEW price of .02 cents psi equals $194.40, which I would round up to either $195 or $200. By raising your price by one half a cent, you just gave yourself a $50 raise! And, if you quilted 5 Queen Size quilts per month, you would have an extra $250 for doing the same kind and same amount of work you did in the past!! I now want to change subjects completely. I have been talking and emailing with a professional machine quilter and she has a very unique situation. With her permission, I am going to outline what her problem is and see if you have any suggestions to help her. This quilter lives in a medium sized metropolitan city. The area she lives in, over the last many years has changed considerably and it now considered “un-safe to live in” (her words) and her customers don’t and won’t come to her home to drop off their quilts. She has enough customers, does quality work, charges a very good price for her services and needs her quilting income to help support herself. Because her area is has a high crime rate, she has no vehicle (too many times her car was stolen or vandalized) and must use public transportation to get around. If needed, she can – and has – rented a car for the day, but must travel by bus to the car rental office. She is in the process of moving to a different, safer location, but that is still several months away, if everything works out well. Do you have any ideas or suggestions for her and her situation? If you do, please write them in the comments section. I have given her some suggestions (I’ll post them later) and now we both would like to hear from you. 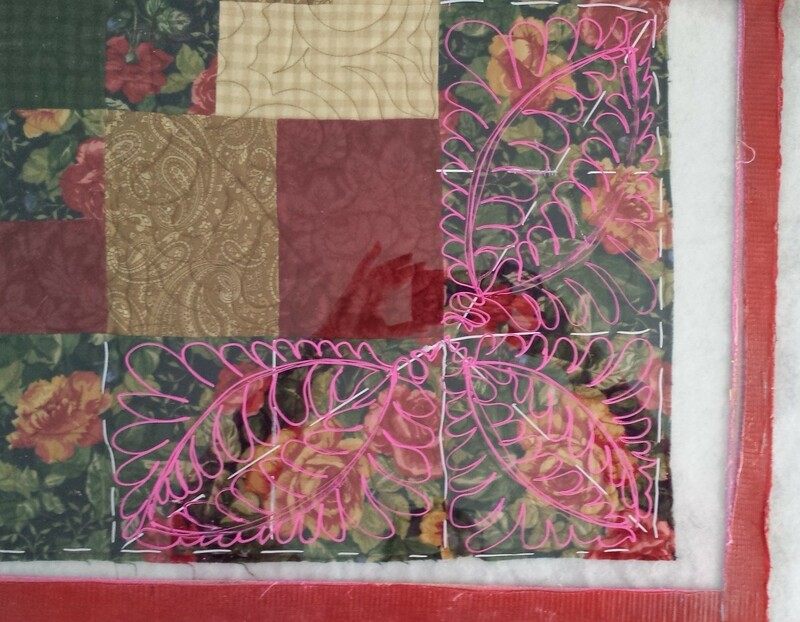 This quilter does subscribe to this blog and will be reading your comments. I thank you in advance for any thoughts, suggestions or comments.